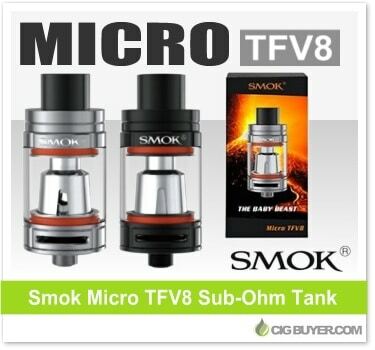 A reduced-size version of the 24mm TFV8 Tank, the Smok Micro TFV8 Tank has many of the same great features as the original, but it’s 1/3 smaller with 3ml of e-juice capacity. Also referred to as the “Baby Beast,” this 22mm tank has dual adjustable air slots on the base with a redesigned air chamber and drip tip, but what really sets it apart are the amazing pre-built coils. It comes with two new coil heads – a Micro V8-S Core (0.2 ohm dual coil) and a Micro V8-D Core (0.15 ohm quad coil). Both are designed to pump out serious clouds and flavor.